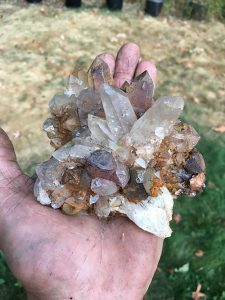 This quartz specimen from the Condor claim is covered in chlorite balls. Deep in the Cascade Mountains of Washington state and up the Middle Fork Snoqualmie River reside the richest crystallized mineral deposits in the state. 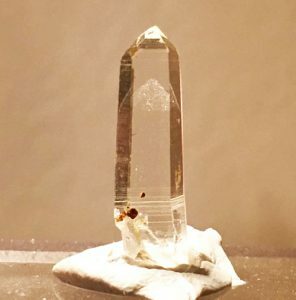 This world-class locality has provided collectors with unique specimens of quartz, amethyst, pyrite, and other accessory minerals for decades. While there are many mineral claims up and down the valley, I had the opportunity to catch up with J.T. 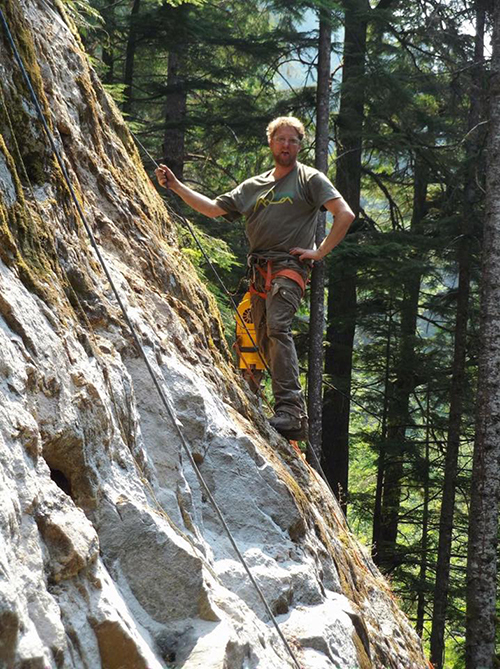 Hilton to visit and learn about his Hemlock Ridge claims. Not only that, but I was able to track down previous claim owners to learn about their experiences and see amazing old-stock specimens. This group of claims is rich in history and produced unique specimens, found nowhere else. We discussed the importance of keeping their claims active, and I even got to visit the Hemlock Claims to have a chance to find some specimens. The claims that are covered in this article reside in the Snoqualmie Batholith of the Snoqualmie-Mount Baker National Forest. This geologic formation has a long history. It all began between 28 mya and 22 mya, during the late Oligocene to early Miocene, when the old Cascade Volcanic Arc was uplifted. Natural erosion over thousands of years exposed plutonic rocks, which happened to be intruded by various rock types. This dirty specimen has just been pulled out of a vug at the Puffball claim. The rock type we are concerned with is intrusive breccia. It occurs when volatiles force their way to the top of an intrusion as it cools. The force causes the surrounding rock to crack. Later on, hydrothermal fluids packed with minerals make their way into these cracks, depositing their mineral load, which will later form crystals such as quartz and various sulfides. The Hemlock Ridge claims are in the same neck of woods as the world-famous Spruce Ridge and Green Ridge claims. While Hemlock may not be as well known, it is still equally important when one considers its unique mineral combinations, which are not found anywhere else in this mountainous area. The Hemlock group consists of the Puffball, Condor, Shangri-La and Hemlock claims. Each one is unique in its own right. Puffball is the easiest to access, making it easier to haul up drills, blasting equipment, and hand tools. 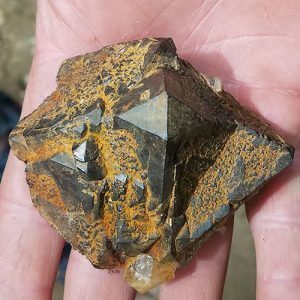 This claim may be the most unique claim; there you can find multiple mineral combinations consisting of quartz, dog-tooth calcite, pyrite, molybdenite, ankerite, siderite, and many other minerals. Puffball is the most actively worked. J.T. commonly brings along friends to help him with the hard work that is involved in removing specimens. 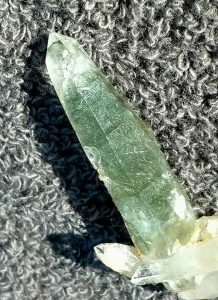 The Condor claim is known for its mineral combination of quartz included with bright, long, green actinolite crystal sprays. This claim is owned by three men: J.T., Ed Moslee, and Sal Noeldner. 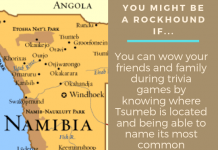 This locality is harder to reach, with a longer hike involved. However, it is always worth the trip because of its unique mineral combinations. You will likely never see quartz included with actinolite from other localities. The Shangri-La claim is harder to get to. However, this claim is the most mineralized and is worth the hike because of the sheer abundance of quartz crystals—they lie all over in the tailings chute. The breccia is very decomposed, which makes rocks easier to move. With a large steel bar, you can easily begin plowing through the breccia, exposing quartz vugs. Finally, the Hemlock claim rests high above the other claims, connecting Condor and Shangri-La. There is not as much activity up here because of the steepness of the claim. It is a hard-to-reach locality and there is not as much mineralization here. However, it still belongs to the Hemlock Ridge group. Phantoms are often found at the Hemlock Ridge claims. 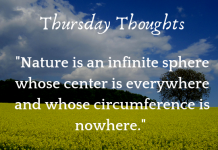 surrounding active claims for a number of reasons. One reason is its elevation, which is a bit lower than some surrounding areas. Not only that, they can also be worked earlier in the year because they do not reside in a sensitive wildlife habitat. Other nearby claims have to hold off from blasting a while longer due to habitat, but since the Hemlock claims do not impose on these sensitive areas, miners can commence with blasting a month or so earlier. J.T. has held a stake in these claims for over seven years. He has been artisan hardrock mining for over 13 years and is proficient in removing specimens in pristine condition. He is also responsible for the staking of the Puffball, Hemlock and Shangri-La claims, which he owns. He is highly motivated, often bringing everyone together to make things happen. The Hemlock claims have been around for about 50 years, being worked by different groups of folks throughout the years. For one reason or another, older miners move on to other projects or sell their share of the claim, allowing new and inspired blood to take over. When J.T. and his business partners took over, these claims were not active and were receding back to their natural state. Now they are being revived, and wonderful mineral specimens are continuing to be extracted for enthusiast to enjoy. Recently, I had taken some of my quartz crystals to a friend, Bill Mcknight, to have them processed using metal deposition, which turns them into aqua aura quartz. In conversing, I was surprised to learn that Bill, in collaboration with Bob Jackson of Spruce Ridge, used to own and work the Condor claim back in the early 1980s. Back then, this claim was called Pegasus, not Condor. We were able to talk about Bill and Bob’s experience there, and I even got to see some of the finest material to have been mined from there. Bill’s actinolite-included quartz is spectacular. He had large, doubly terminated quartz with green actinolite sprays shooting through it. In his display case, there was also a large plate of long, slender quartz crystals; every point had phantoms and actinolite inclusions. These specimens truly are one-of-a-kind and can only be found at Condor. Bill was excited to hear of our adventures up there and passed on some of his knowledge of the claim to help these guys in their future endeavors. Toward the end of my visit with Bill, he pulled out his old photo collection of his team of guys working up there. This was a real treat to see. 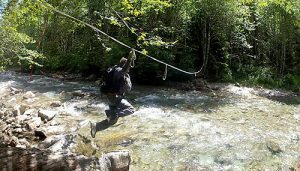 A zipline must be taken to cross the river before heading up to the claims. Later that afternoon, after visiting with Bill, I met up with J.T. to talk more about the Hemlock claims. He expressed to me the importance of keeping these claims active and alive. In the past, these claims have been worked to varying degrees. Some periods of time have been very active and some periods of time have seen no activity, almost as though the claims had been forgotten about. Regulations, rules, and ideas of what to do with the land are always changing. Currently, the claims are on public Forest Service lands, but there is the potential that the land could be turned into wilderness land. If that were to happen, it could affect the status of the claims. That is why it is so important to keep the claims active; as long as this happens, the hope is that the Forest Service will recognize their importance and allow the claims to continue to be worked. If the claims were not active and the Forest Service land got turned into a wilderness area, the ability to reclaim would be gone. Another important reason to continue working hard is the unique mineral combinations that occur here. They represent the area’s mineral wealth and allow mineral collectors to see the complete picture of what can be found here. Every claim up the Middle Fork Snoqualmie River provides something unique, whether it is amethyst or large pyrite crystals. Without the Hemlock claims, that picture would not be complete, for they provide minerals that are not found at the other claims. Later that night, J.T. and I and a few others set up at the base camp and prepared to make the hike up to the Shangri-La claim the following day. Everyone else had a fire, made dinner, and traded stories about past dig adventures. My girlfriend, Brittney, and I had reservations at the Goldmeyer Hot Springs, which coincidently is in very close proximity to the claims. It is a real treat to be able to hit the hot springs before or after a day of mineral collecting. The next morning, we all met back up and stoked the fire to share a breakfast before heading up to the claim. To begin our hike up to Shangri-la, we had to cross a fast-flowing river. Luckily for us, there was a zip line. We got our harnesses on then took turns dashing across safely to the other side. The hike up through a mix of young- and old-growth cedar and fir trees took about an hour. It was a sight to see those old-growth trees towering above our heads. At the end of our hike, we suddenly broke out of the trees and found ourselves at the base of a very steep rock chute. Instantly, we noticed quartz crystals all over a rock chute that steeply cuts through middle of the claim. This was a good sign. We hadn’t made it to the main working area, but we were already finding quartz points littering the ground. The Shangri-la claim consists of 20 acres and roughly encompasses the entire rock chute, as well as the rock wall exposures surrounding the chute. Some of us focused on collecting crystal points in the chute, while others went to the walls on either side of the chute in hopes of finding a fresh vug to collect from. At the Puffball claim, large pyrite crystals are abundant. me move really big rocks. I climbed as high as I could and tied myself off for safety. Then I rappelled down over a vertical wall to a spot I felt would be productive. As I hung high above the ground, I used the leverage of my steel bar to pluck off large boulders. I kept my eyes open to spot exposed vugs, and to my luck I found a fresh vug right away. I was able to pull out multiple free-floating plates of quartz crystals. Toward the end of the day, we all reconvened to share our finds of the day and to talk about our time collecting. We all did well and were thankful for the opportunity to be out collecting fine mineral specimens in the beautiful Snoqualmie National Forest. I was curious what the guys do with all the quartz and other mineral specimens they find. 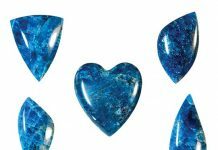 Some of the finer mineral specimens remain in their personal collections, but most of them undergo a basic acid-bath cleaning and are prepared for sale and trade. 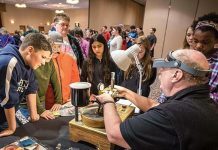 You may run into, J.T., Ed and Sal at a number of mineral shows around the state. The best place to meet these guys and see their collections is at the Seattle Mineral Market, which goes on in May. They also display some of their collection online, via social media such as Facebook and Instagram. J.T. he revealed his plans for the future of the Hemlock claims: working hard to keep the claims active and productive. His team will be up there blasting and extracting as much as possible. J.T. shared that they would like to develop a mill site down near the base camp so they can have an area for processing minerals more efficiently and make it more comfortable for sleeping overnights. Other than that, they strive to get the word out there about the Hemlock claims and the treasures that are coming out of the ground. Washington is held in high regard when it comes to its fine quartz specimens. Such claims as Spruce and Green Ridge have already placed the region on the map, and have shown the world what we have out here. J.T., Ed and Sal hope to continue in this tradition and share with everyone the fine specimens they are finding that can only be found in one location: Hemlock Ridge. 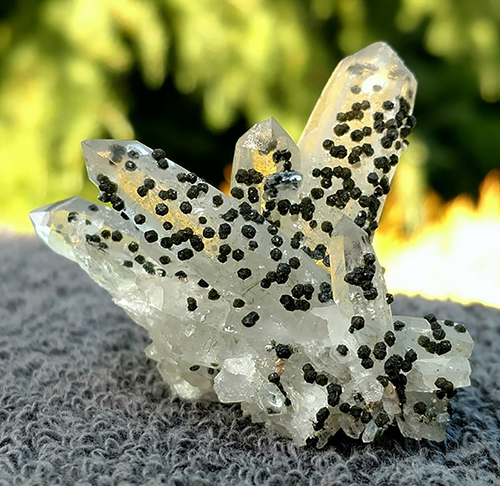 A superb quartz specimen from Condor contains heavy actinolite inclusions. 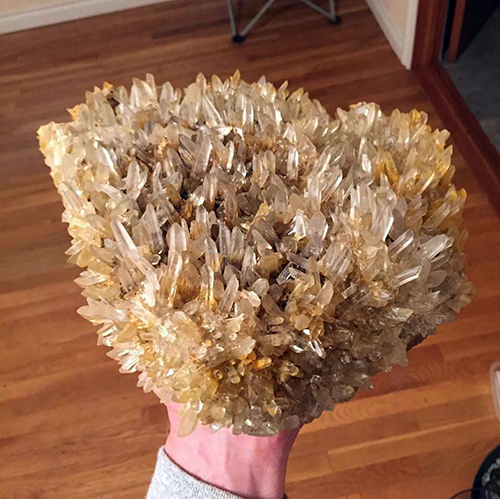 This large plate of quartz was found laying on the ground at the Shangri-La claim. J.T. Hilton prepares for blasting a fresh bench at the Puffball claim.